Here in Pennsylvania, we have had record snow fall this month. We are expecting another snow storm to hit the area any time now. I don’t mind the snow if I can stay at home with my family. That hasn’t been the case…the snowfall seems to coordinate with my work schedule (you get no slack when you work in a hospital). With that being said, I’m ready for spring. While I can’t control what it looks like outside, I can bring a touch of spring indoors. 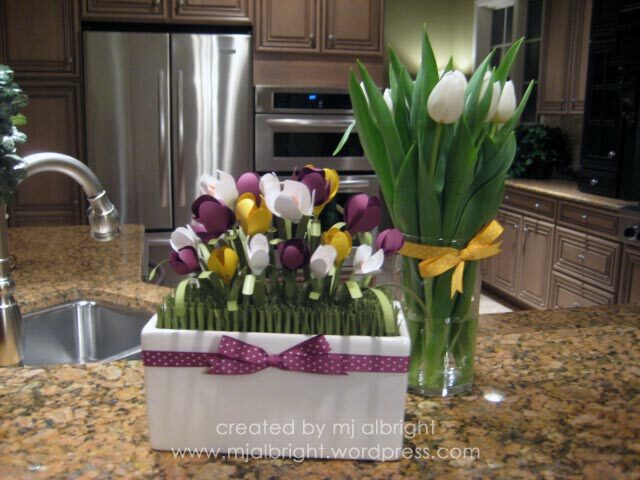 PROJECT #1: The Crocus flower is my way of telling that spring is right around the corner. I love these cute little flowers. I researched all the types, all the colors, and studied their shape. 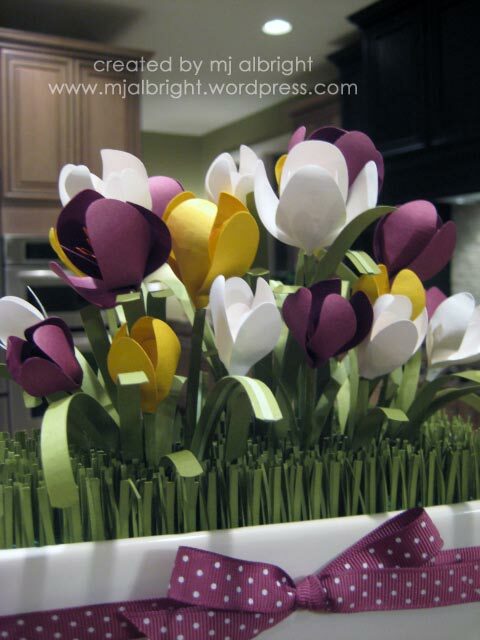 After gathering my information, I got started making my Paper Crocus planter. I used Stampin’ Up!’s Small and Large Oval Punches for the Crocus petals. My color palette for this project is Whisper White, Rich Razzleberry, and Crushed Curry. 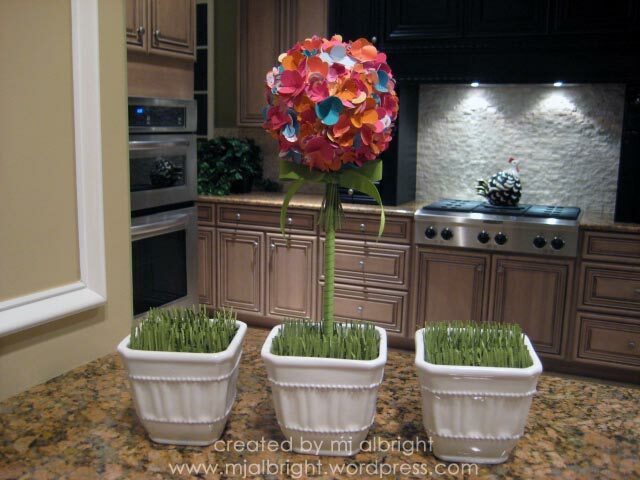 It did take a long time to cut out Old Olive cardstock to create the grass bedding for the base of this arrangement. I wanted to create a plush dense grass base. This helps with the shapes…the transition from the white ceramic planter up to the grass is smooth and easy on the eyes/easy to look at, making you focus up on the flowers. 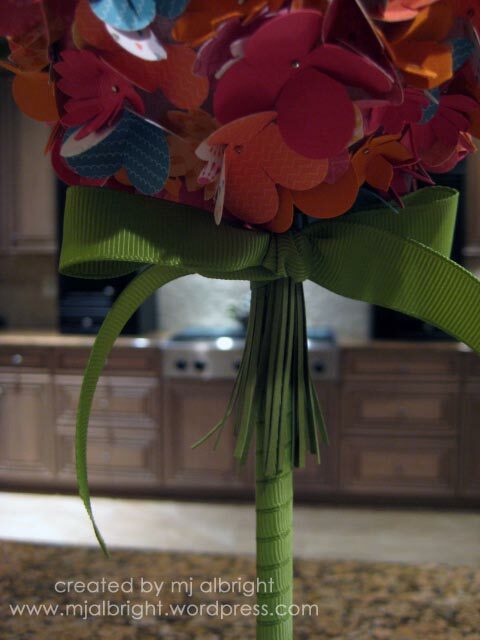 PROJECT#2: Since I love creating projects that are bright and eye-catching, I had to create another paper flower arrangement. This flower is a late spring bloomer called ‘Allium Giganteum’. 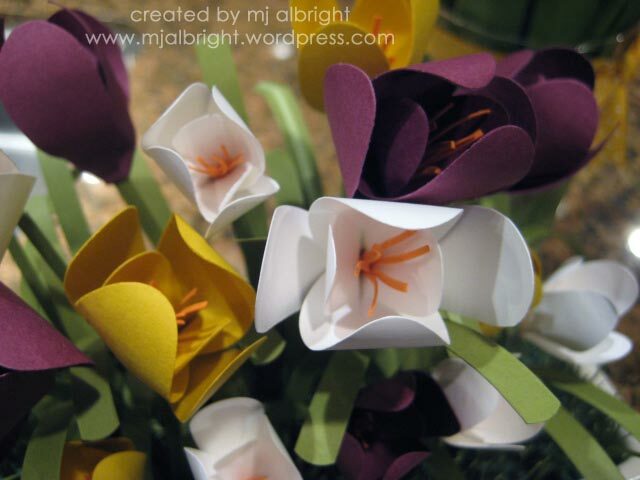 This flower is purple….the great thing about papercrafting is that I can make my flower whatever colors my heart desires. My original vision was to create three of these beauties. Well, after 2 hours of pinning tons of little flowers to just one single styrofoam ball, my plans changed. So I left the other two little pots with just the Old Olive grass. 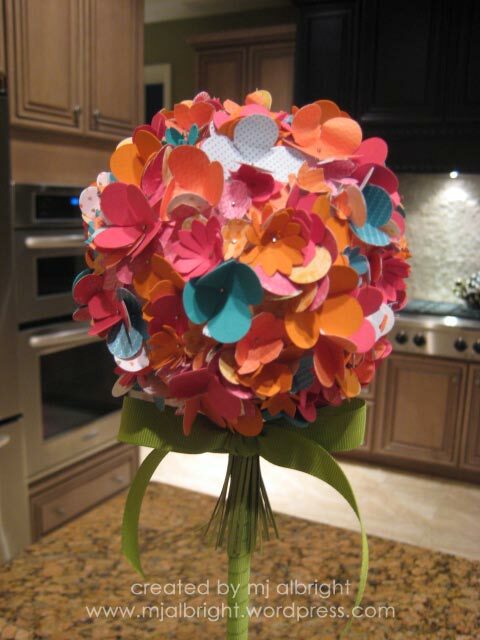 There are approximately 250 small flowers used above to create this flower. My color palette for this project is Old Olive, Melon Mambo, Pumpkin Pie, and Bermuda Bay. Several types of Designer Series Papers were used (supplies listed at end of post). 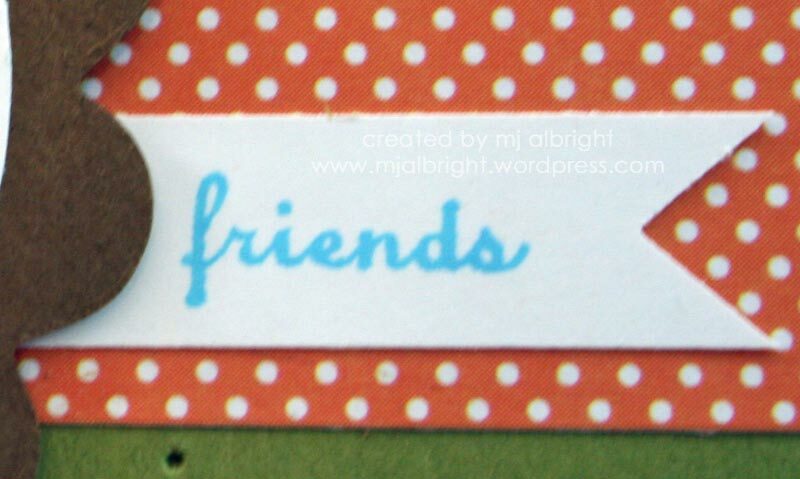 PROJECT #1: Whisper White, Rich Razzleberry, Old Olive, Crushed Curry, and Pumpkin Pie cardstock; Rich Razzleberry 1/2″ Polka-Dot Grosgrain Ribbon; Small and Large Oval Punches; Word Window Punch. PROJECT #2: Melon Mambo, Bermuda Bay, and Pumpkin Pie cardstock; Kaleidoscope, Razzleberry Lemonade, Sunny Day, and Welcome Neighbor Designer Series Papers; Big Shot Die-Cut Machine; SU! Floral Fusion sizzlits die; SU! 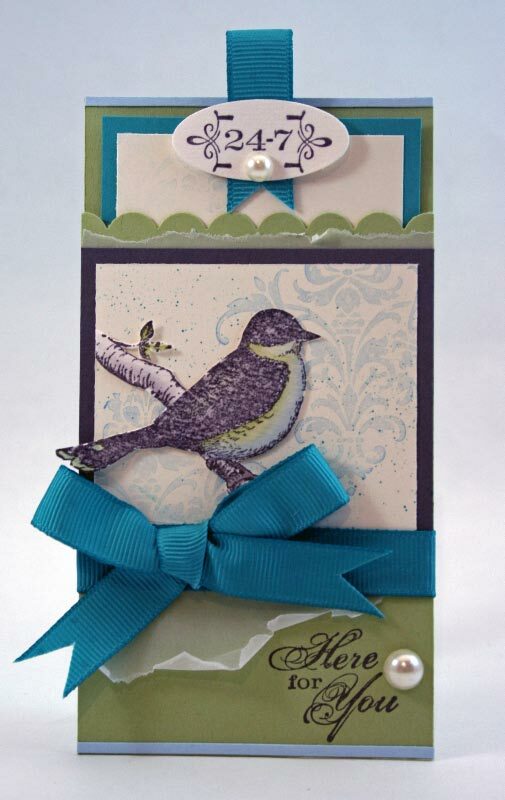 Birds & Blooms sizzlits die; Boho Blossoms Punch; Old Olive 1/4″ and 5/8″ Grosgrain Ribbon. I received a list from my son’s kindergarten class with all of his peers names for Valentine cards. Somehow 2 more kids showed up since the school group picture was sent home. Since I had to make 2 more Valentine’s, I put together this tutorial for you on how I made my Sweet Treat Cup Valentines (with the tag that stops). I’m a bit thorough, so there are lots of pictures below. It will be picture followed by the directions for that above picture. With the 3-1/2″ x 10-1/2″ piece of cardstock, score long side at 3-1/2″ and 7″. Score the short side at 1/4″ and 3-1/4″. 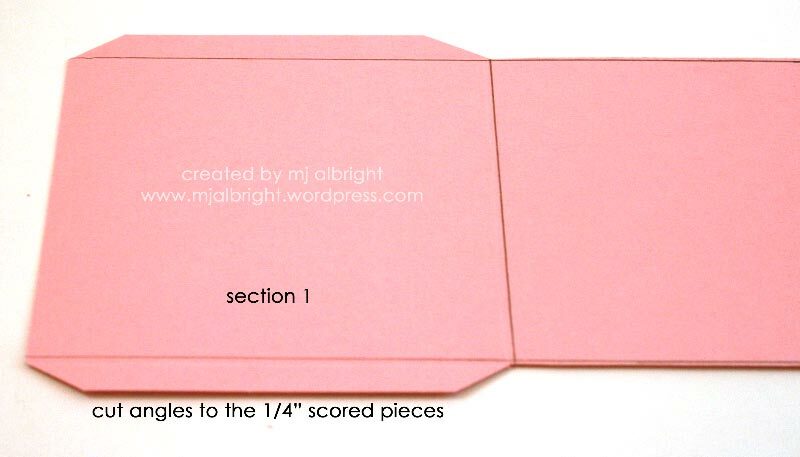 For simple creating purposes, I have numbered the sections on the piece of cardstock…this will help you while creating. Cut away 1/4″ scored pieces from sections 2 and 3. Leave the 1/4″ scored pieces on section 1. 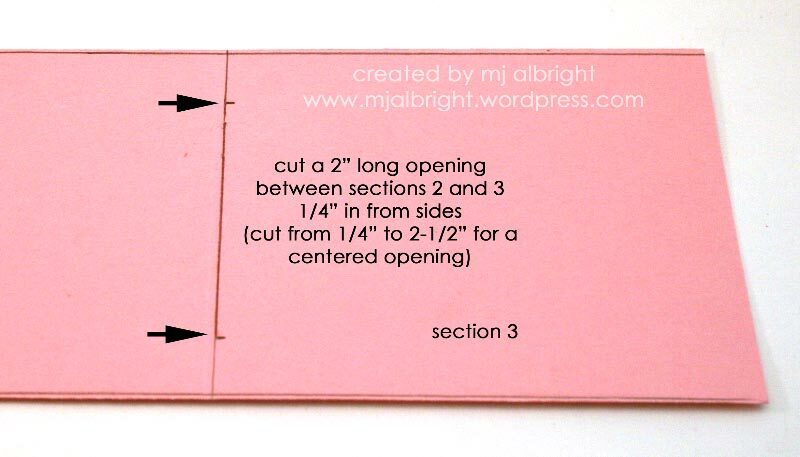 Cut angles to the 1/4″ scored pieces left on section 1. This is done so these tabs can be tucked within the card in the final step. Like the picture states, you will need to use your Hobby Blade and Setting Mat to cut a 2″ opening on the score line between section 2 and 3. Using a 1-3/4″ Circle Punch, you need to punch a circle to section 1. I punched this circle more towards the edge and just a tad off centered (this is necessary when using a punch, so later punching works with the paper size). This is how your 3-1/2″ x 10-1/2″ piece of cardstock should look at this point. 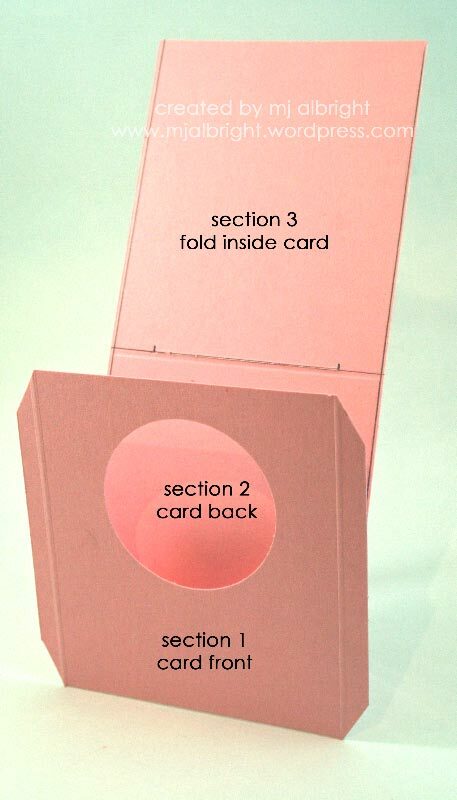 Section 1 is the cardfront. Section 2 is the back of the card. Section 3 gets folded inside and will not be seen when assembled (this is where the Sweet Treat Cup adheres to). Fold section 3 inside. Then fold section 1 on top of that (tri-fold). 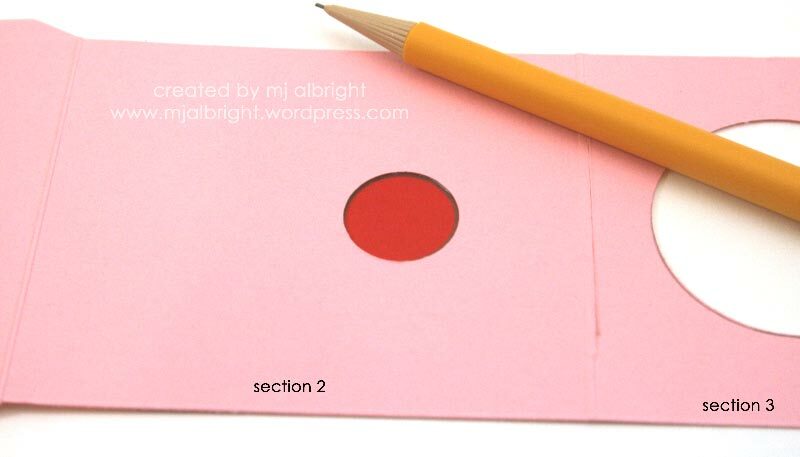 Using a pencil, mark your circle from section 1 onto section 3. 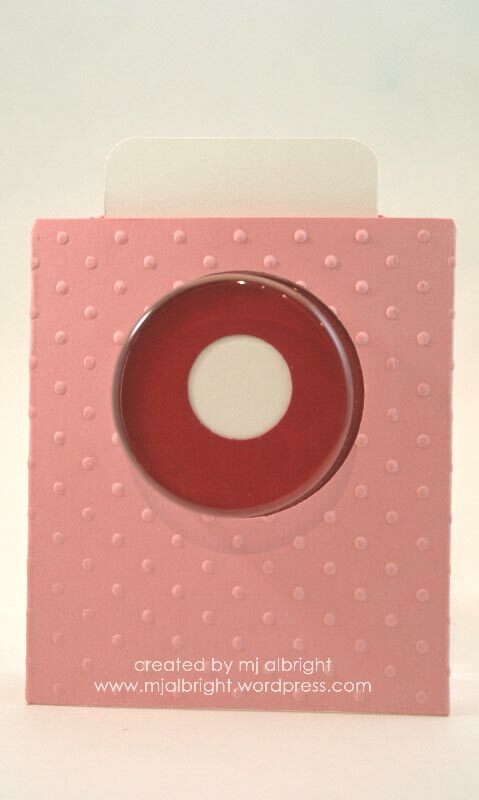 Punch out with your 1-3/4″ Circle Punch. This is how your 3-1/2″ x 10-1/2″ piece of cardstock should look at this point. 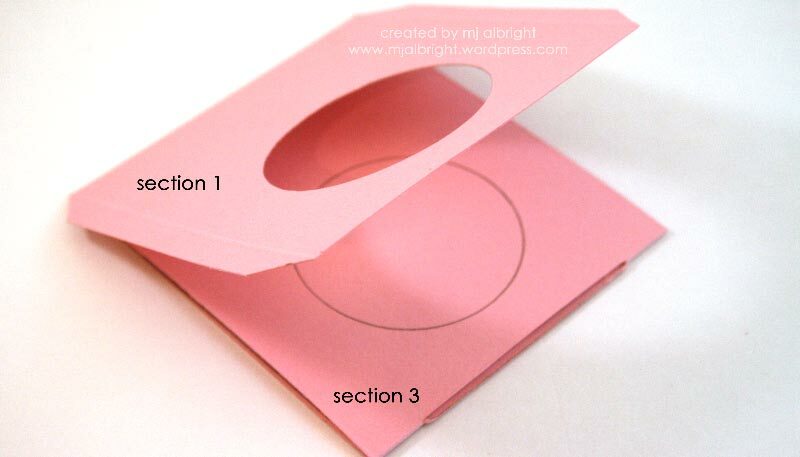 With the dimensions used, you would never be able to use a punch to section 3 if the circle was perfectly centered. It’s off a tad, but you can’t notice….unless a ruler is pulled out. I’m sure you won’t encounter that. Place cardstock piece in position above. 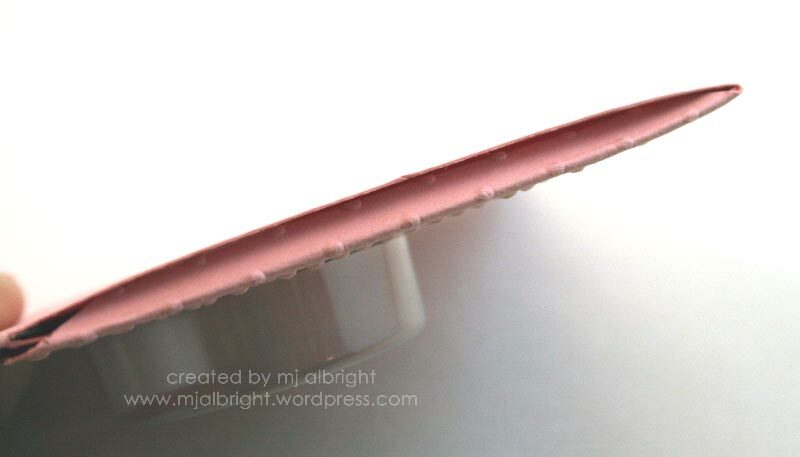 You will need your 3/4″ Circle Punch now to create the small hole where you gain access to the Sweet Treat Cup contents. 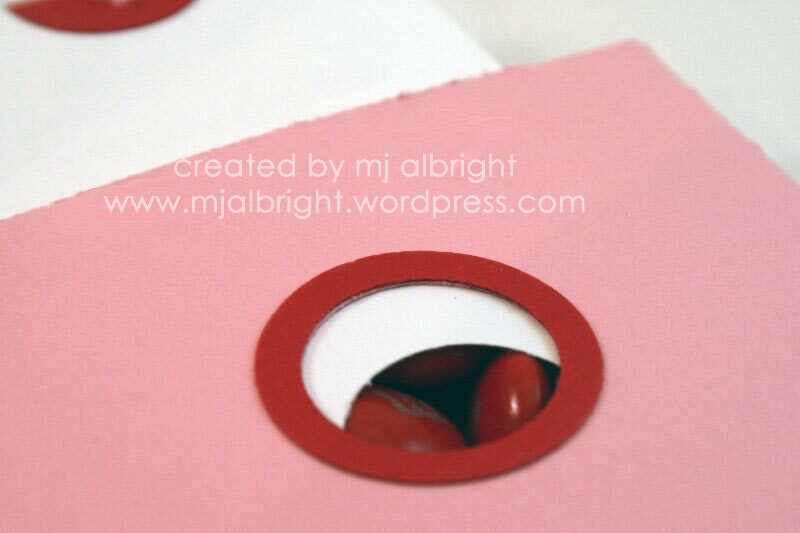 You need to slide your 3/4″ Circle Punch through the 2″ cut opening all the way till it stops. Punch out a circle to section 2. This is how your 3-1/2″ x 10-1/2″ piece of cardstock should look at this point. 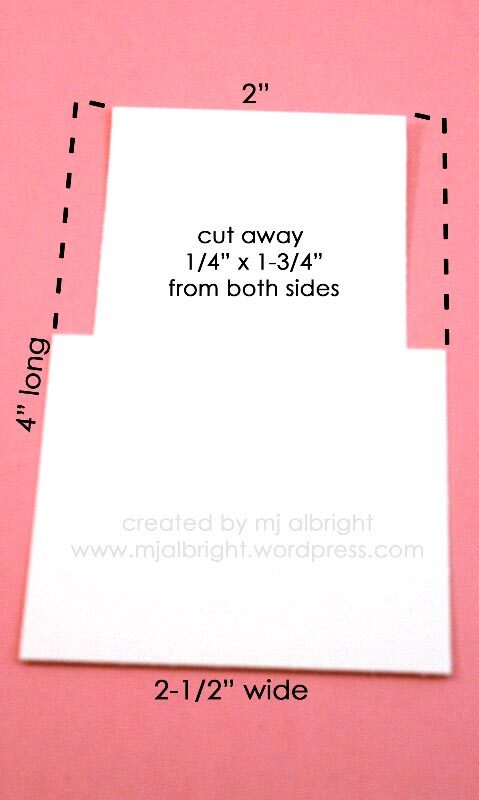 With the 2-1/2″ x 4″ piece of cardstock, you will need to make some cuts shown in the picture above. 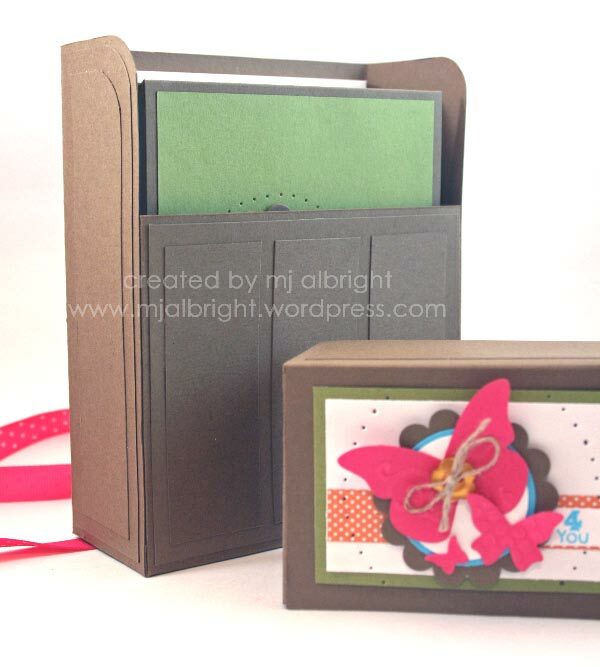 You will need to cut away 1/4″ x 1-3/4″ sections from both sides to one end of the piece of cardstock. These notches are what prevents the tag from pulling all the way out. They become “stoppers” so to say. Here are all of the pieces you need to finish the card at this point. 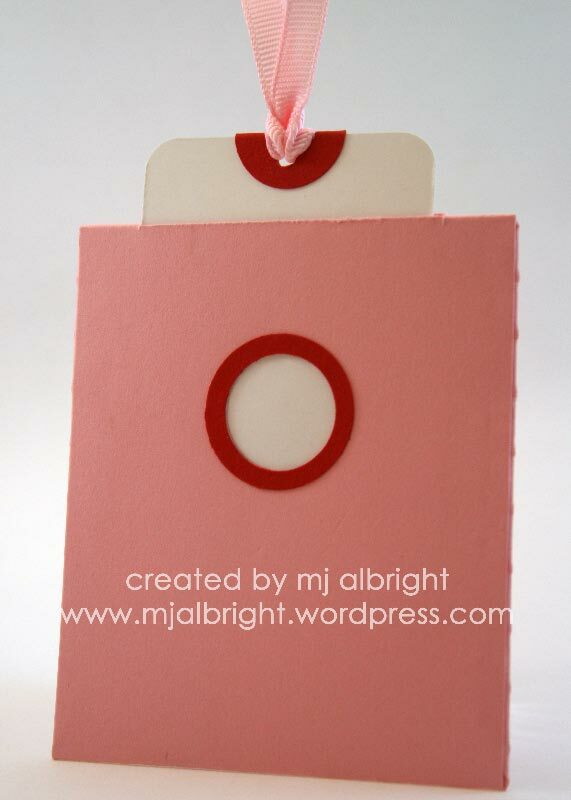 Place the 2-1/4″ x 2-1/4″ square piece of cardstock on section 2, along the score line centered. I marked my piece of cardstock so I could keep track of which side is to be aligned on the score line. This is important so your circles line up. Holding the pieces in place with your hands (or use some Dotto if you need to…so you can rub off adhesive), flip over. 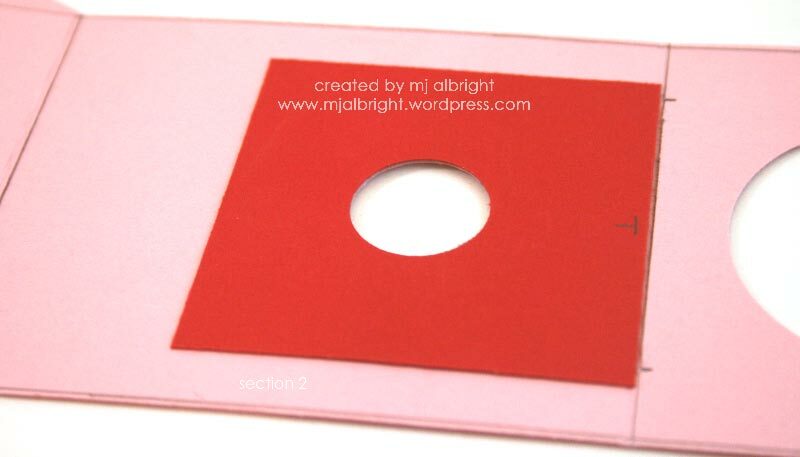 Using a pencil, mark your circle onto the Real Red square piece of cardstock. 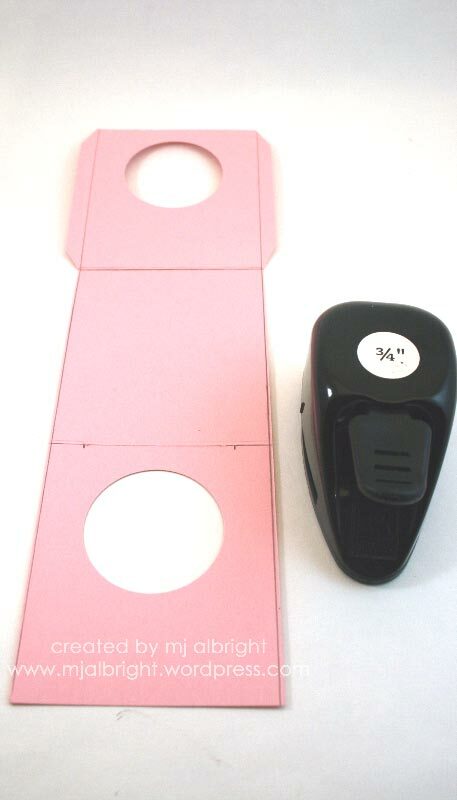 Punch out using your 3/4″ Circle Punch. You want the circles to align perfectly. Slide the tag into the 2″ opening as shown in the above picture. Slide this tag all the way till it stops at the notches. Make sure it’s centered. Holding the pieces in place with your hands (or use some Dotto if you need to…so you can rub off adhesive), flip over. 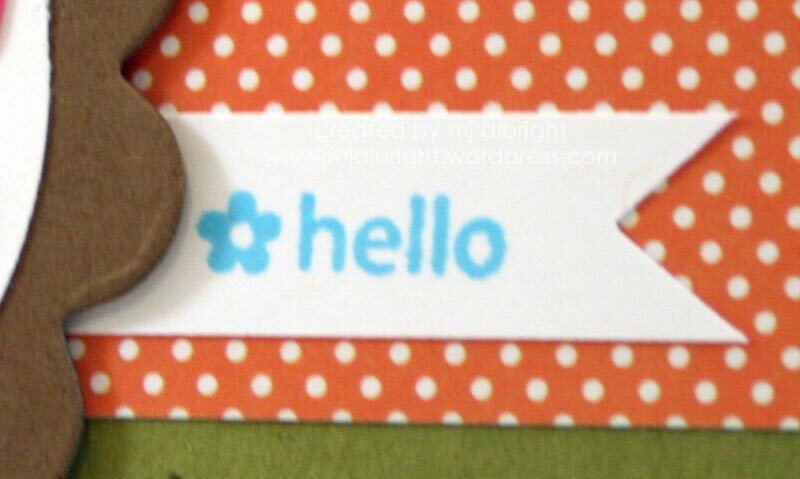 Using a pencil, mark your circle onto the Whisper White tag cardstock piece. 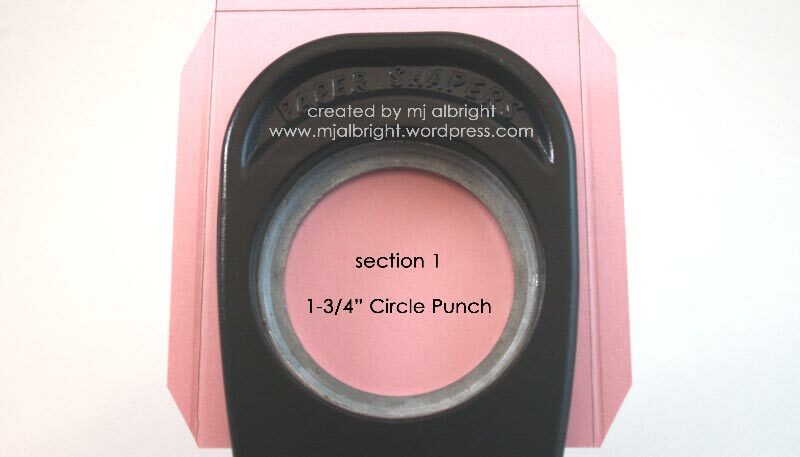 Punch out using your 3/4″ Circle Punch. This is how your pieces of cardstock should look at this point. You are now done punching, and it’s time for assembling. Attach your Sweet Treat cup to the circle on section 3. 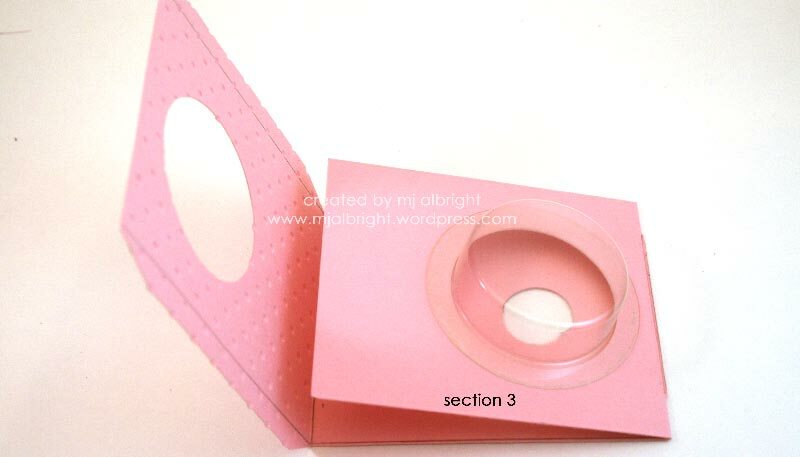 Adhere the 2-1/4″ x 2-1/4″ square cardstock piece to section 3. This piece keeps the contents in the Sweet Treat Cup. The circle gives you access to the contents. 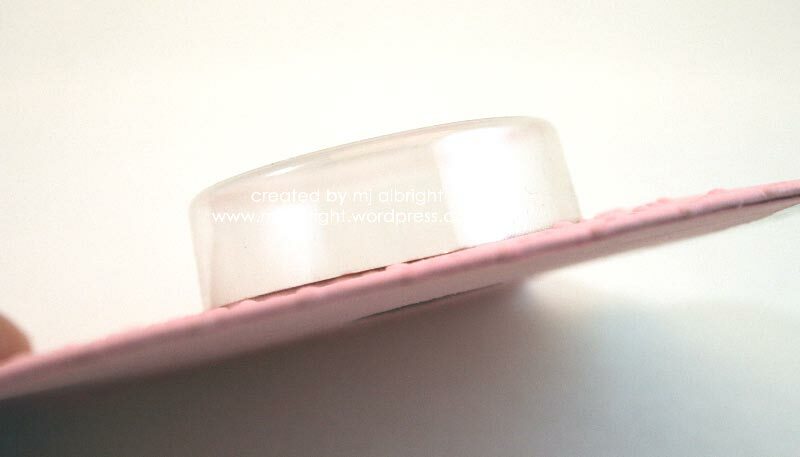 Slide the tag back into the 2″ opening (make sure all circles align). If they don’t by this point, try flipping over your tag….this is why I mark my pieces so I know which sides go where. Tri-fold your card closed. Bring section 3 in first followed by section 1. 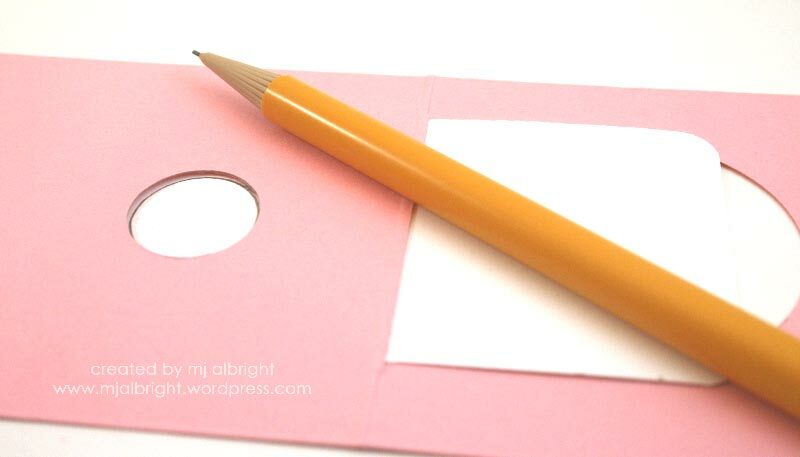 Tuck in the 1/4″ tabs on section 1 to the inside of the card. Sticking the tip of your Tombow Multi Purpose Adhesive between the layers, apply some adhesive to the tabs that a tucked in and apply pressure (wipe away any that may seep out while applying pressure). 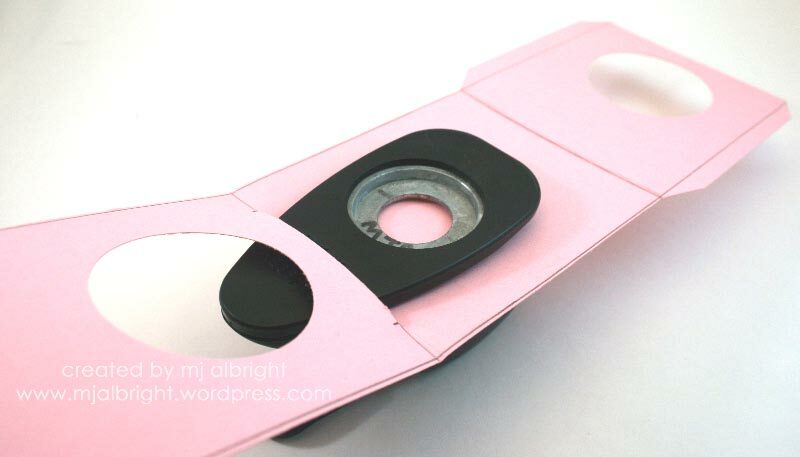 You will also want to make sure your tag functions—-because if you apply too much adhesive, it may seep inward and cause your tag to adhere to the inside of the card—-preventing you from being able to pull on tag. This is what your cardfront looks like when assembled. When the tag is downward (not pulled up), you have a circle that is closed on the back of the card. When the tag is upward (pulled up), you have a circle that is opened on the back of the card. You now have access to the Sweet Treat Cup contents. You take what you need and then push the tag back down to close your opening. Stamp and embellish as desired. I’m ahead of the game (for once). My Mom loves butterflies. Her birthday is in the beginning of March. I wanted to make her something that she could use. 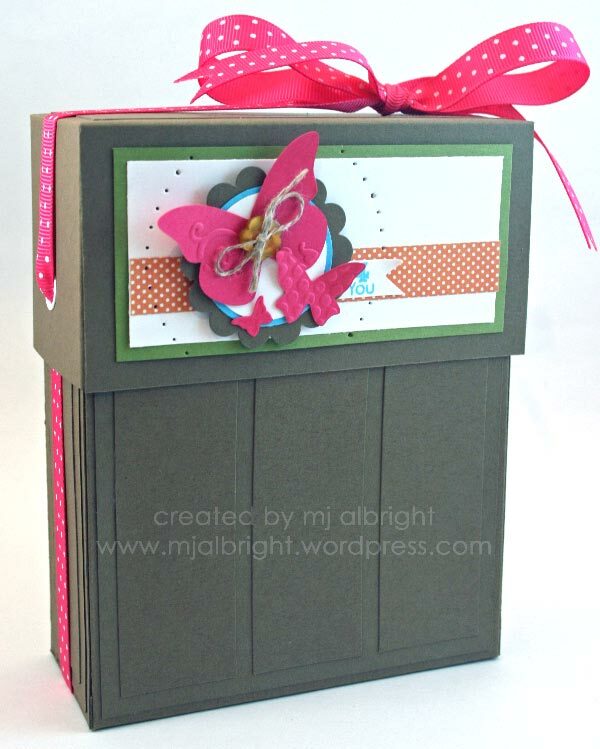 With her love for butterflies, I decided to make her a card giftbox with an assortment of cards, with different sentiments, that she can send out to her friends. Here is the outside of the box. I used Soft Suede cardstock to create the box and lid. To keep the lid secured on the box, I used small white grommets to the sides of the lid and threaded Melon Mambo ribbon through so I could tie a bow on top. The added strips of Soft Suede cardstock running vertically on the outside of the box is a nice subtle touch of detail……it also adds extra strength to the box making it sturdy. I added details to the front of the lid only. This is the theme that continues to the goodies that are inside the box. 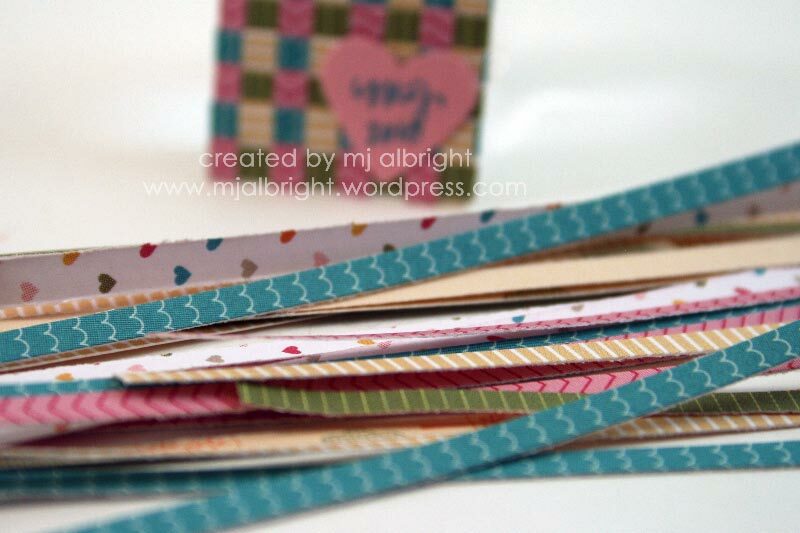 I kept the details just to the lid as to not take away from the Soft Suede cardstock strips. It all works so well together. Untie the ribbon and remove the lid to expose 8 cards and envelopes inside the box. I’m the first to admit that it is extremely hard for me to create simple cards. I FORCED myself to try and keep the 8 cards simple. I think they turned out just right. Easy to re-create. Above is the cardfront. I used the same layout on all of the cards. Above is a picture that shows the inside of the cards. Enough Whisper White cardstock so my mom can write a personal message inside. 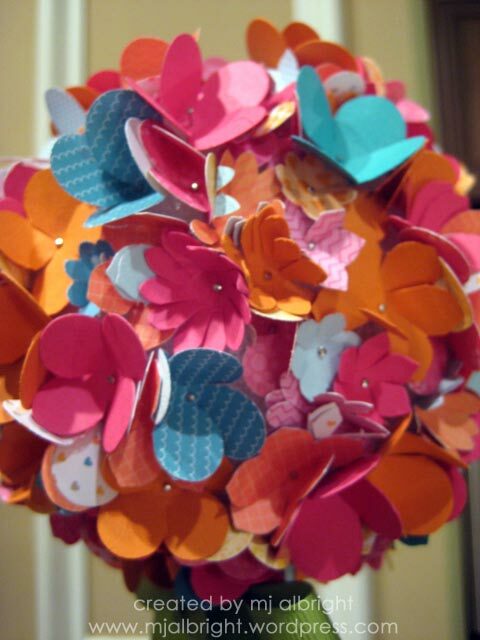 I wasn’t wasting any of the butterflies that were die-cut, so I added them to the insides. Using Tiny Tags stamp set from the Occasions Mini Catalog, I was able to use these tiny little sentiments….2 cards for each sentiment in the box. 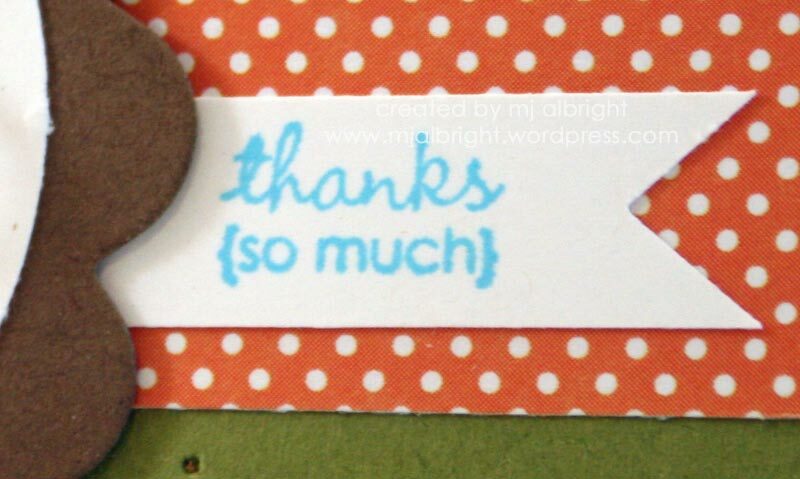 I stamped the sentiments using Tempting Turquoise ink on Whisper White cardstock. Punched out with my Word Window Punch. I used my My way punch to create the cuts to the right. **I don’t have a template, directions,or dimensions to this project. Unfortunately, when I’m creating, I don’t write information down during the process. PAPERS: Sweet Pea Designer Series Paper Stack; Soft Suede, Tempting Turquoise, Old Olive, Whisper White, and Melon Mambo cardstock. 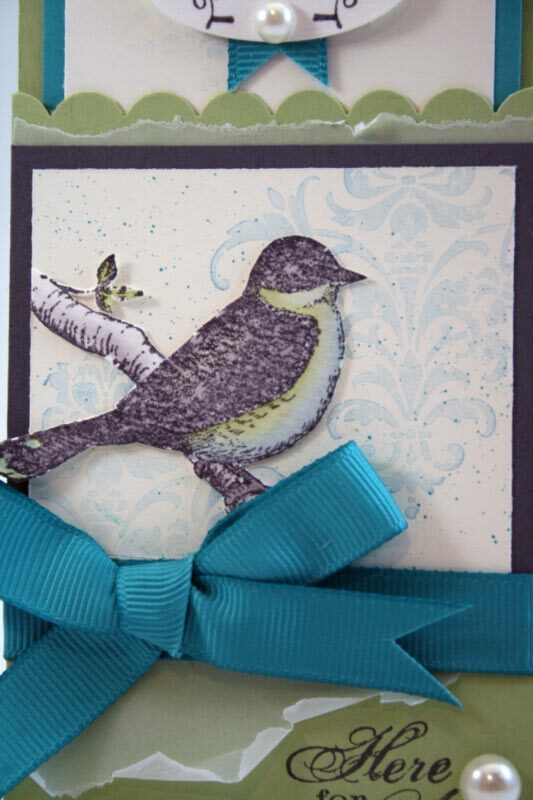 INKS: Tempting Turquoise Classic Stampin’ Pad. ACCESSORIES: Basic Small Grommets Designer Hardware; Playground Designer Buttons; Melon Mambo 1/2″ Polka-Dot Grosgrain Ribbon; Linen Thread; 1-3/4″, 1-3/8″, 1-1/4″ Circle Punches; My Way Punch; Word Window Punch; Scallop Circle Punch; Mat Pack & Paper-Piercing Tool; Big Shot Die-Cut Machine; SU! Beautiful Wings Embosslit Die (Occasions Mini Catalog); SU! Pennant bigz xl die. I’m not a jewelry kinda person. I had to think of another way for me to utilize Stampin’ Up!’s new line of chains with charms called Simply Adorned. I have the 1″ x 1-1/4″ Locket-style charm (116798) that I will be using on my keychain. Not much working room for someone like me who likes to focus in on those little details. This is the front view of the locket. The glass is beveled so some areas in the above image look a bit distorted. So, below is a pic of my little piece of art outside of the locket. Thought this would be a cute little image for a keychain. 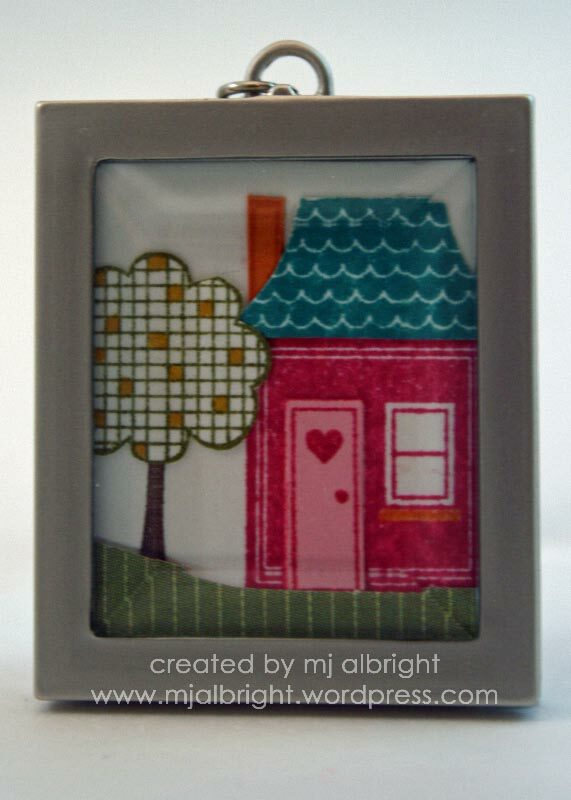 I used Sale-A-Bration stamp set Good Neighbors to create the scene. How about the coordinating Designer Series Papers for this stamp set? I had to use the Welcome Neighbor Designer Series Paper Pad on this project. Again, with the work area being rather small, I wanted the front to showcase stamping. For the back, I wanted to showcase my love for papers! I created a small woven sampler for the back (the glass is flat on the back–not beveled). You must have patience if you are going to attempt the above! It took about 30 minutes to create this small woven sampler area. 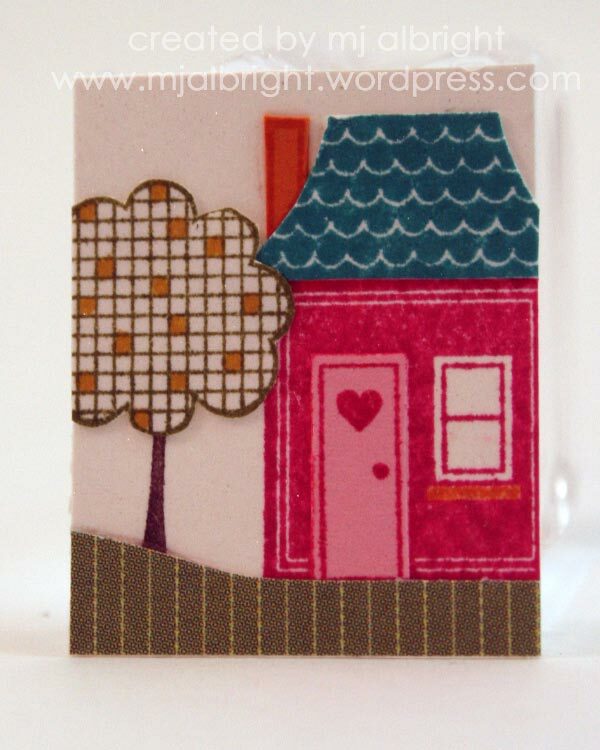 I used several small strips of the patterned paper measuring 1/8″ x 6″. 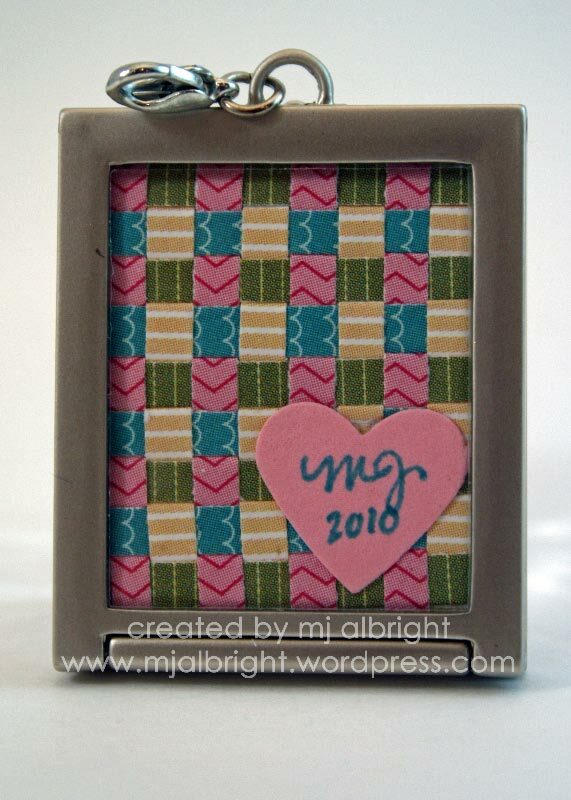 I used my Small Heart Punch, Pretty in Pink cardstock, and a Bermuda Bay Stampin’ Write Marker to create the heart. PAPERS: Sale-A-Bration Welcome Neighbor Designer Series Paper Pad; Shimmery White cardstock; Pretty in Pink and Pumpkin Pie cardstock. INKS: Melon Mambo, Bermuda Bay, Pumpkin Pie, and Old Olive Classic Stampin’ Pads; Bermuda Bay, Crushed Curry, and Pumpkin Pie Stampin’ Write Markers. 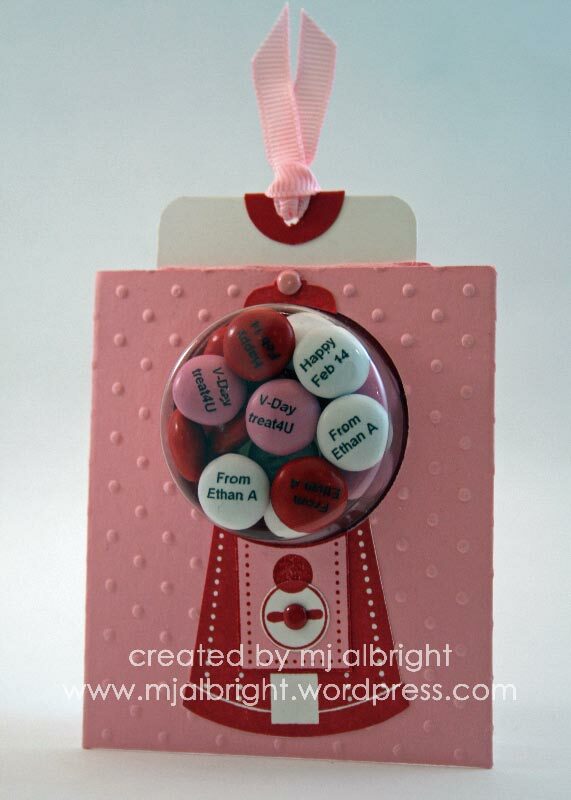 ACCESSORIES: Simply Adorned Charm 1″ x 1-1/4″; Small Heart Punch (occasions mini catalog). I just love creating cards for my hubby John. 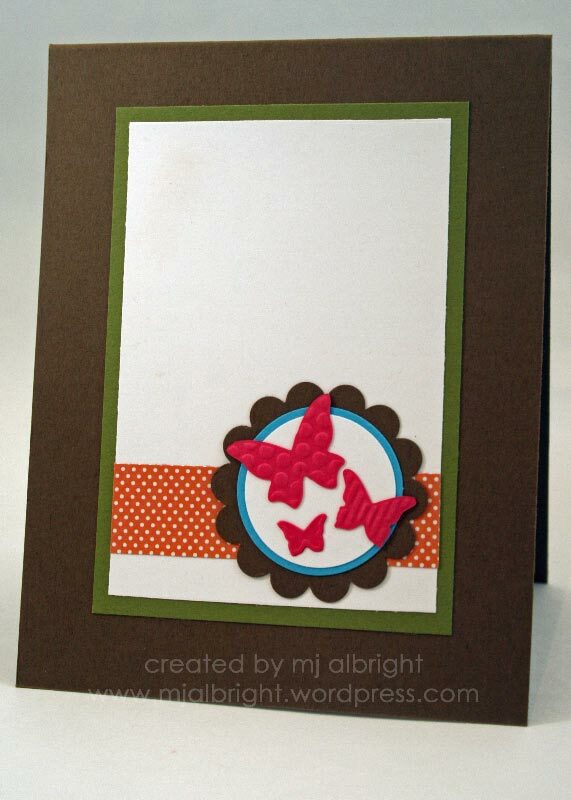 It’s funny…when I’m making something for him, I am 100% focused and really put all of my heart into the card. 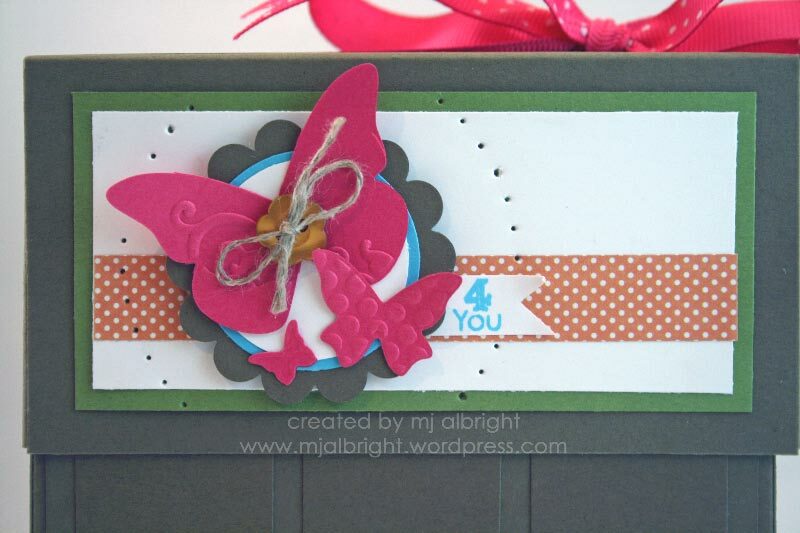 I wanted to create a bright card with tons of love sentiments pulled from many different stamp sets. I also wanted to incorporate an all-business theme. What do you think? This cardfront will definitely reinforce just how I feel about him. Below is an upclose pic of all the elements. 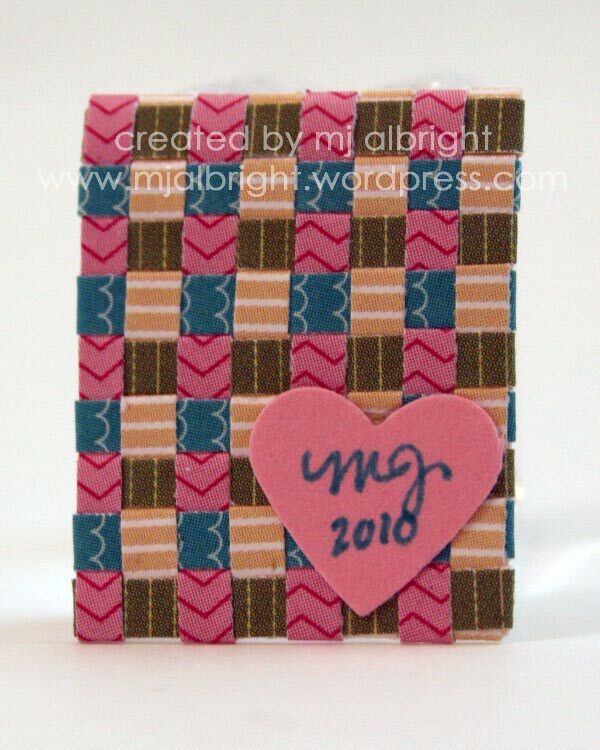 I used four different stamp sets to create this cardfront. 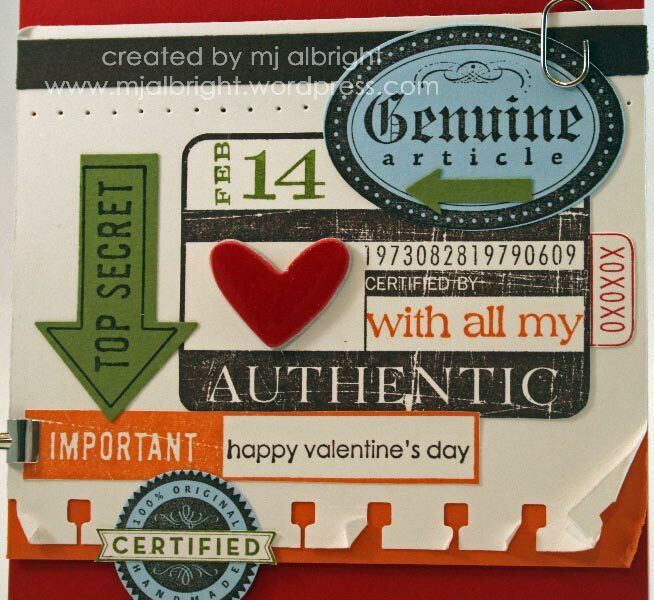 STAMPS: With All My Heart (occasions mini catalog), Admit It (hostess stamp set), Certified, and A Happy Heart stamp sets. PAPERS: Real Red, Bashful Blue, Old Olive, Pumpkin Pie, Chocolate Chip, and Whisper White cardstock. 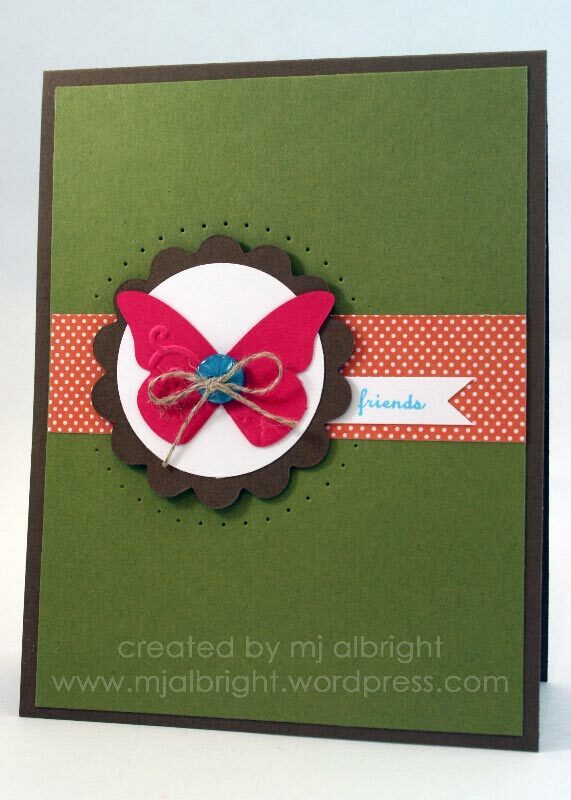 INKS: Real Red, Old Olive, Pumpkin Pie, and Chocolate Chip Classic Stampin’ Pads. 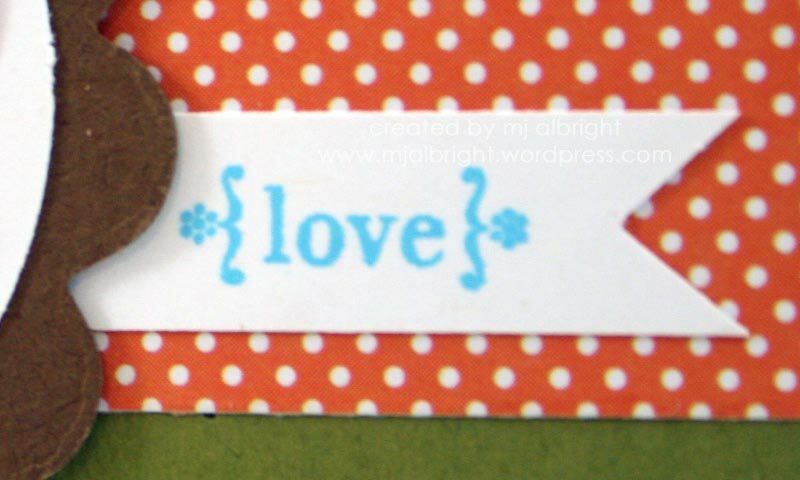 ACCESSORIES: Clips Assortment; Mini Library Clips; On Board So Tweet; Wide Oval Punch; My Way Punch; 1-1/4″ Circle Punch; Spiral Punch; Crystal Effects; Stampin’ Dimensionals; Mat Pack and Paper-Piercing Tool. I was hesitant to play around with the Sweet Treat Cups. I had to sketch, visualize, and become a paper architect while working with them. I think they would work better if the adhesive was on the opposite side from where it is (does that make sense?). They just take some playing with. But, once you get playing & creating with these cups, they are super fun…and the possibilities are endless. All I have to say is, “Thank goodness I only had to create for a Kindergarten size classroom!”. They were time consuming, but soooo worth it! 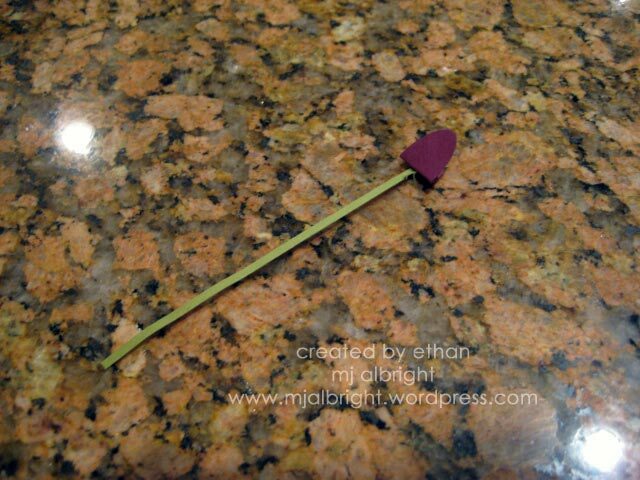 Ethan loves them too. The card measures 3″ x 3.5″ and is just the perfect size for a kiddo to pass out at school. 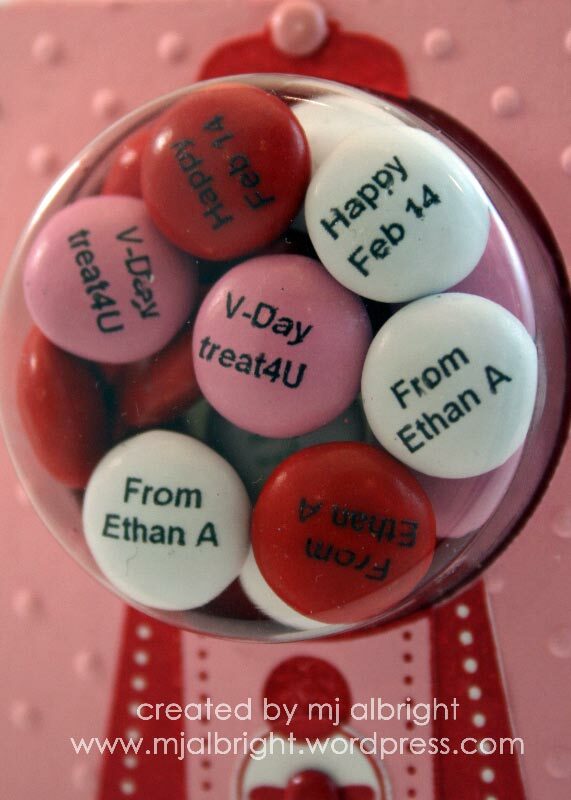 Here are the personalized M&M’s. There are 3 Ethan’s in his class so my Ethan is now known as “Ethan A”. 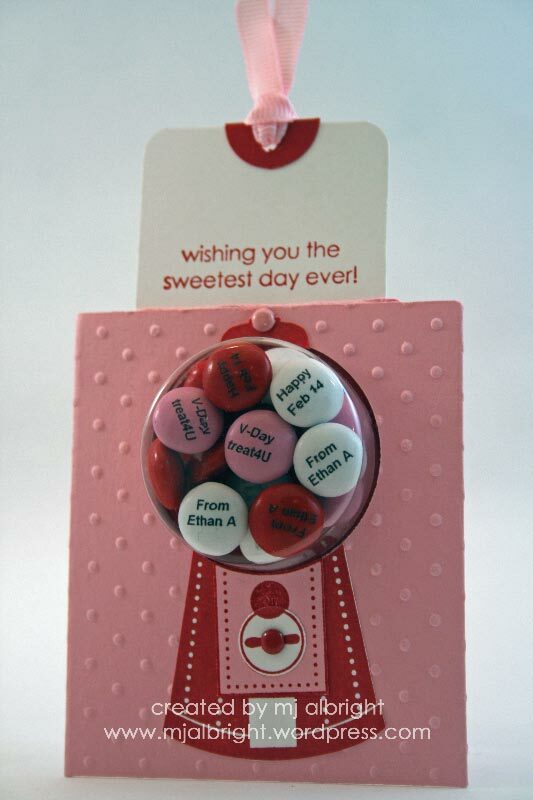 I didn’t want a sentiment on the front of the card, so the other two M&M’s say “Happy Feb 14th” and “V-Day treats4U”. I do have to admit that a handful of the M&M’s were smeared and not printed perfectly. How do I get to those M&M’s? 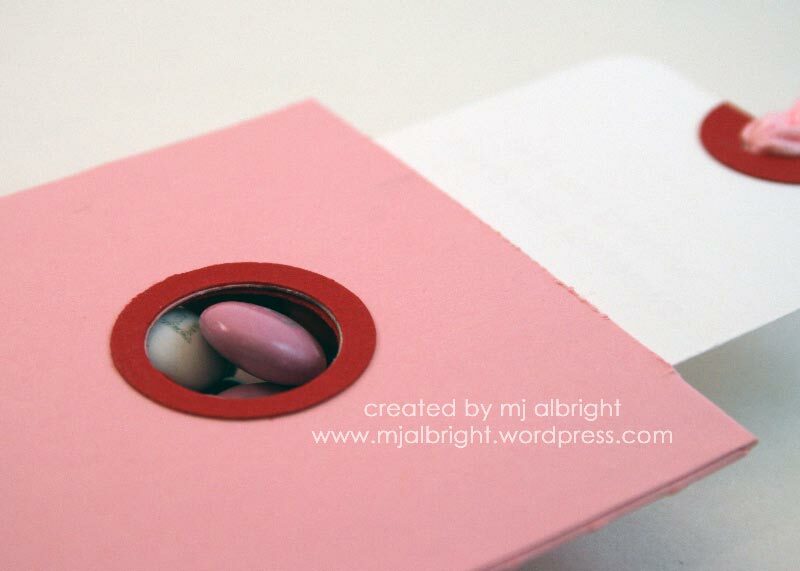 The Whisper White cardstock tag at the top of the card has two purposes…..it reveals a sweet sentiment and opens a circle on the back of the valentine card. The Whisper White cardstock tag does not come out all the way. I created it to stop at a certain point. Above is a back view with the Whisper White tag inside the card (not pulled up). I used my 3/4″ Circle Punch to create the whole. Above picture is Whisper White tag pulled all the way up till it stops. You now have an open circle that exposes your treat. INK: Pretty in Pink and Real Red Classic Stampin’ Pads. 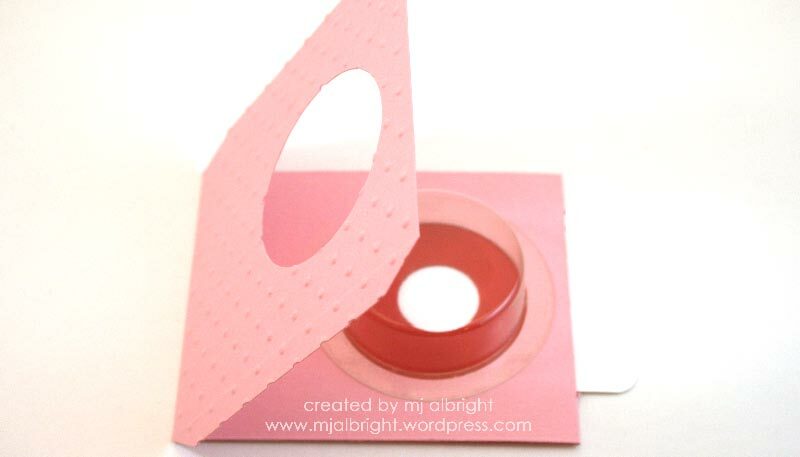 ACCESSORIES: 1/4″ Pretty in Pink Grosgrain Ribbon; Sweet Treat Cups; Bold Brights Brads assortment; Soft Subtles Brads assortment; 1-3/4′, 1/2″, 3/4″, and 1″ Circle Punches; Big Shot Die-cutting machine; SU! 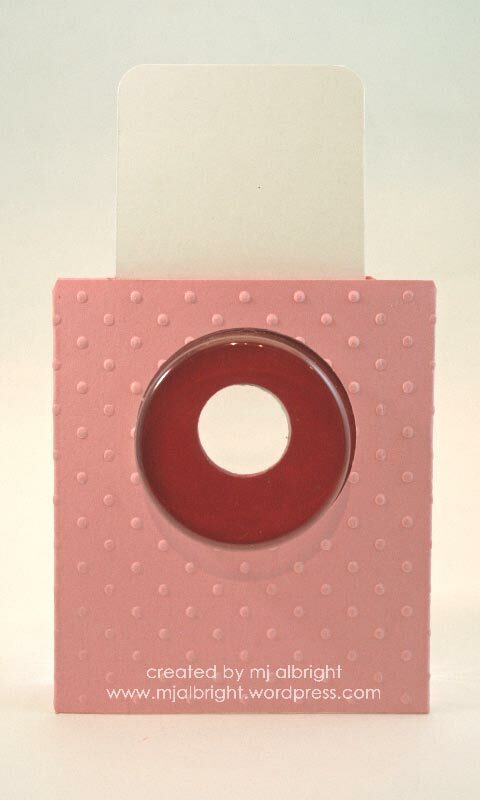 Perfect Polka Dots Textured Impressions Folder; 3/16″ Corner Rounder Punch; Crop-A-Dile Tool.